Sustainability in design has been an interest of mine since the first architecture class I took in high school (which is also what led me to become an engineer rather than an architect), and the convergence of my education in sustainable building design and interest in fashion is what gave me the idea to start blogging about sustainable and ethical fashion. Among the first posts I ever published (in 2012!) were “An Introduction to Fair Trade”, “Shopping More Consciously”, and “January: National Slavery and Human Trafficking Prevention Month”. Those types of posts are ones I plan to get back into writing; especially as the topic of sustainability, ethics, and inclusion continue to move to the forefront of the conversations surrounding fashion and design. Today is the annual USGBC Midwest IMPACT Conference – a day-long conference devoted to what will be the new normal in sustainable building design and how we can get the whole industry there. I won’t be able to attend this year but have in years past and excited to see what is next. Also exciting are some of the sustainable and ethical fashion events coming up in the Twin Cities. Talking about “how the sausage gets made” was not a big part of the conversation when I started blogging about it, but global initiatives like the Fashion Revolution have grown and the modern day consumer demanding more information about supply chain and manufacturing processes is bringing that conversation to the mainstream. 10 am – 3 pm; Topics/Sessions and more info at registration link below. Fashion Revolution Minnesota hosts its first Shaping Fashion summit this Fashion Revolution Week. The event is FREE and open to the public – prior registration encouraged. This event also includes a sewing/mending lab and marketplace. Topics to be discussed include Feminism + Fashion, Secrets of Shopping Secondhand, Wear Your Values, and Building an Inclusive Fashion Industry. I am so excited about this event, especially for the Building an Inclusive Fashion Industry session, hosted by Flyover. This issue something I have grappled with a lot – I realize I am in a position of privilege in being able to shop from local, ethical, or sustainable brands or to have the time and energy to spend looking into these brands. I have gotten pushback from people believing that making those choices won’t matter, or only rich people can afford to make those choices, and even that thrift store prices are going up and starting to become out of reach for some shoppers since people who wouldn’t ordinarily shop secondhand are doing so now. At last year’s IMPACT conference, we talked a lot about being bold and paving the new way forward – about leading with purpose and focusing on equity, not just diversity. I look forward to seeing how those ideas for better buildings parallel ideas for more ethical and sustainable clothes and shopping habits. Hopefully, this discussion can break down how we get to the point that ethical and sustainable fashion is for everyone - because it is. The Minneapolis-St. Paul Chapter of Fashion Group International hosts a panel discussion on sustainability in fashion, moderated by the Trend and Style Editor for Mpls St. Paul Magazine, Madeline Nachbar. Panelists include a sustainable boutique owner, educators and university department chairs with work focused on social responsibility, and a beauty brand creative director. As ethics and sustainability become hot topics from the consumer side, it is crucial to see industry leaders talking about these issues and teaching the next generation of the fashion industry to go beyond buzzwords and live by example. 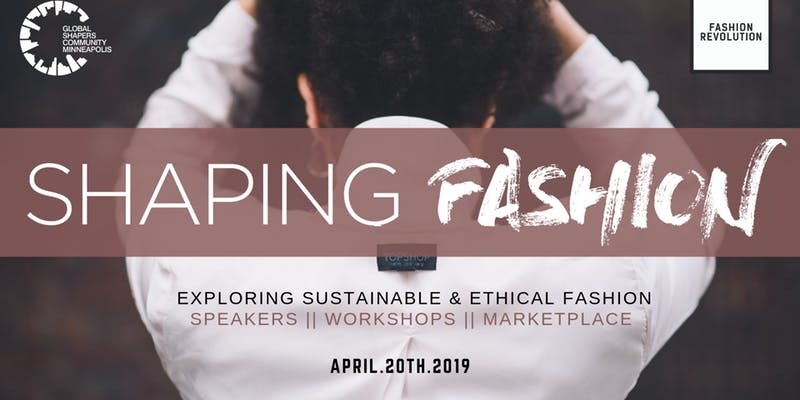 This educational evening focused on ethical and sustainable garment production includes a keynote presentation, panel discussion, and factory tour – something exclusive to this event. Local clothing manufacturing facility Clothier Design Source opens its doors to curious fashion designers, business owners, and enthusiasts. The tour will take guests behind-the-scenes through the process, start to finish, of ethical garment production.